This is the review I have just put on www.amazon.co.uk. I have written this inside the front cover of my copy as it is what Dr Johnson has proved beyond doubt throughout his career. I can see how this can be applied to any and every person, any group and to the whole of society/our world. 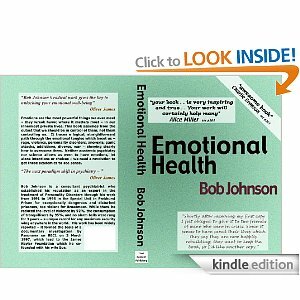 Some highlights for me include the first sentence of the foreword, “Emotions are the single most vital ingredient in all human affairs.” – This is so true and yet most psychiatrists refuse to talk about anything emotional, which for patients is confusing to say the least. Page 53 – I like the simple idea that illnesses often/usually become curable once the causes are known. It is the same for just about all physical illness and ‘mental illness’. By half way through the link between ‘frozen terror’ and addictive behaviour had become a lot clearer in my mind. It clearly explains how so many of us, when not addicted to drugs etc, become addicted to work. It is as if we are too frightened to stop and face our fears. As addictions go, they say that “work is better than whiskey” but sorting out what is causing our addictions has to be better still. Overall, the book left me with an increased strength in the belief that ‘mental illness’ is an out of date expression as these troubles are all simply different degrees of emotional distress. I am responding to this by increasing the emphasis on emotions in the training I offer. The world is going to be a better place for us all when more people are able to get help for difficult emotions before they start to be labelled as mentally ill. It is well recognised that effectiveness in the real world depends on having a belief that we make a difference. (This Stephen R Covey describes as the first habit of highly effective people. He says, “Be proactive”.) Dr Johnson steers clear of simply stating that we have free will as that is always being disputed. Instead, a series of discussions to emphasise the diagnostic manual approach of ignoring the mind and treating the brain as simply a clockwork organ has never had any success in reducing the incidence of emotional distress. As a scientist I can understand the reasoning behind the strange idea of, ‘patients are incapable of decision-making’, but in the real world it is plain stupid. Patients invariably want to make decisions, and allowing patients to make decisions is a key factor in all recovery. I found the first half of the book very powerful as there are many accounts from Dr Johnson’s work in prisons. By describing extreme cases of emotional distressed linked with murder and life-sentences, the links between our own distress and our future emotions become clearer. It can leave no doubt that it is the events in our life we need to look to when considering how happy or sad we are and not anything that could have been programmed before we were born. There is a lot more in this book and I am sure I will be increasingly making use of the concepts I have read here. This is an exceptionally good book. A book everyone working in healthcare should make themselves familiar with.